Charlton Abbotts is a commercial landscape contracting company (working predominantly on medium and large scale schemes). In the past we have worked primarily with developers, road schemes, building companies and country estates. We can tackle design and build often in conjunction with a landscape architect practice. We would describe ourselves as commercial landscaping specialists. We are always pleased to tender for soft landscaping works for a wide variety of contracts including housing developments, retail parks, road schemes and town centre amenity projects. e.g. visibility splays on highways, and scrub clearance for nature conservation. We also carry out maintenance contracts for landscaping schemes, soil stabilisation and erosion control on sites where large volumes of water create a risk of soil erosion or for stabilising steep banks. We have experiences in stabilisation techniques. Turfmat - Large reinforced rolls pegged and overlapped to provide erosion protection. Reinforced grass seeded rolls pegged to steep soil slopes to ensure full even establishment. 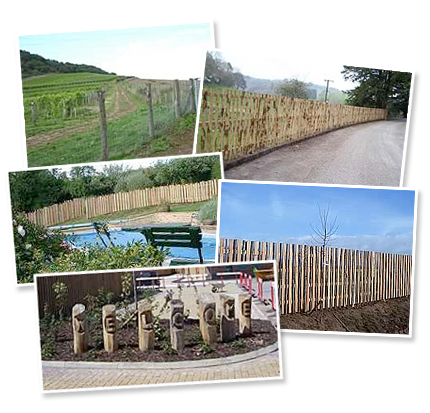 We produce a range of country fences suitable for Gardens and Estates. Our fences are made from home produced timber sourced from local woodlands. Careful selection of species and its relationship to final location enable us, where at all possible to use timber with natural durability. This can avoid the need to use artificial preservatives. Some of the species we use include Oak, Sweet Chestnut, Larch and Western Red Cedar. The trees are converted to fencing specification in the woodland using either traditional hand techniques or a modern mobile bandmill for the large timber. 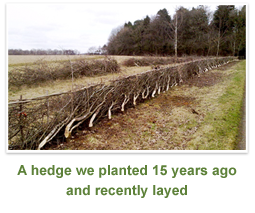 This traditional method of maintaining hedgerows is something that we carry out. Where the hedge is old and "gappy" we may need to plant new hedge plants in the gaps and/or coppice section of the hedge. We are able to supply all of the above items including rabbit guards and even mulch fabric to suppress weed growth. Our hedging stakes are round and cleft the latter produced in local woodland.